How should Auckland respond to the Global Crisis? A little question – globally speaking (how significant is Auckland on the world scene?) - but a huge question for Auckland. So many opinions to consider and assess in a sea of uncertainty. A few disorganised thoughts follow. The main point I wish to make is that I think the “adjustment” that is happening to the global economy is as much to do with the decline in cheap fossil fuel sources, as it is to do with the political mismanagement of property speculation. New Zealand was attractive to colonise because immigrants could pick up gold nuggets in Otago rivers, and fertile harbourside land for a song from easily tricked Maori. The gold ran out long ago and they’re not making more, but changing land use patterns (urbanisation) and commodity opportunities (frozen lamb and now diary products) have continued to stimulate the property market. However, the true costs of New Zealand land development, and who should pay for them, remain largely hidden and therefore politically tolerated. natural environment losses (long term pollution, permitted discharges to water, waste disposal to land). Some of these costs are being paid, but often not by those incurring them. For example infrastructure costs are heavily subsidised by tax and rate payers (state highways, waste water treatment plants). Energy costs for transportation (people going to work, freight costs in manufacture and bringing products to market), are generally met by those requiring transportation services, but those costs impose an unproductive burden, reduce business margins, and generally impede efficient economic development. Finance industry costs are also met by those needing loans and banking services, and the consequences of the global property loan industry collapse are being born by almost everybody, while insiders escape early with their golden parachutes. However environmental costs are not being met. What value is placed on the loss of streams and rivers due to excess water abstraction for agriculture? Who will pay to restore lakes that will suffer for decades from accumulated nitrate and agricultural chemical inflows? How will urbanised clifftop and developed seaside properties be managed from cumulative erosion effects. After World War II, Auckland developed along the lines of the American Dream. In the 1950’s that dream looked very attractive: own your own home; big section; a nice car; cheap petrol; and great roads to get to work. Now that development pattern looks increasingly expensive and economically inefficient in the long term, but it’s still wildly attractive to land speculators, lured by the profits. The alternative to a totally free market is some sort of regulation, formal planning, or public intervention. However there is rarely a neat separation between public and private. Increasingly interest groups are seeking public-private-partnerships. For example, Auckland’s Wynyard Quarter Waterfront development is a public-private partnership. The private sector plays a big part in delivering Auckland’s public transport services. I think it would be rational to ensure infrastructure costs were met through fair capital gains taxes on land value increases (levied only on increases that arise through rezoning and because of publicly provided infrastructure – any value uplift arising directly through the efforts and investments of landowners would not be subject to such a tax.) There are precedents for this. For example Wellington was built and shaped by a tax like this established by Government in the 1920’s. The extent of market failure in finance markets is in dispute. The current public suspicion with banks, lenders and loan sharks means this market is at rock bottom right now. But memories are short and the money lenders will be endlessly creative in establishing new opportunities for making money from money. It's not all bad - good productive business relies upon investment and investors. Who will make that call? Leave it to the market? I don't think so. But the really interesting question is what to do, how to intervene, in respect to land development markets, recognising that the era of cheap transport energy is coming to an end, along with the ideal of the American Dream. Some doubt this. So here are a couple of useful graphs I found on the internet prepared by the Netherlands Bureau for Economic Policy Analysis. The first one shows what we all know. The change in crude oil prices. Some analysts did predict a sharp fall in crude oil prices when supply became constrained. They point to the cost of coal and wood fuel now, compared to its relative cost when those fuels were the fuel of choice. The supply/demand/price pattern was that prices increased sharply as supply failed to meet demand - until the point when substitute fuels were found and adopted. Coal was the fuel of choice for industrial Britain, until it was replaced with electricity and other fuels. Coal was replaced for transportation fuel by oil. This graph doesn't really show anything new. Crude oil prices will likely go up again, but then they will fall because the market doesn't like uncertainty and being held to ransom. We are in a period of post fossil fuel adjustment. 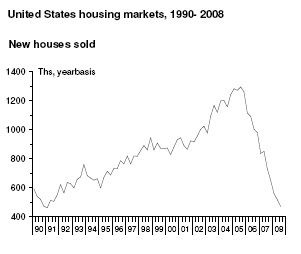 These next two graphs show changes in the US housing market. There have been other periods in history when house prices have fallen sharply. 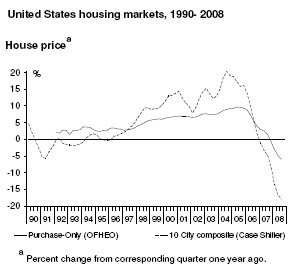 This graph shows that houses prices began to fall sharply in the USA well before the finance crisis hit. The timing is more aligned with the steady and relentless increase in the price of fossil fuel. The reasons for this must include growing public awareness of the transport component cost of living. The further your house is from the things you need: work, school, shops - the more you have to pay out of your pocket to live. Suddenly your housing choice affects the amount of discretionary income you have for other things. The home loan and transport costs have to be paid for - everything else has to be covered from what is left inthe wallet. I am aware that there are households in South Auckland where 40% of the household income is spent on transport: big cars, big families, located big distances (inefficient distances) from work and school. These costs are not covered by the developer of these distant American Dream sub-divisions. But the economy eventually pays. 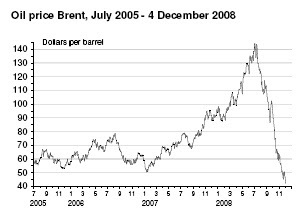 This graph better shows the consequence of the combination of financial/property crisis and the end of cheap fuel. Fear, uncertainty and doubt has struck the property market. Again, these two graphs don't really tell us anything we don't already know. Property prices have fallen, and the land development/speculation industry has collapsed. A consequence of financial uncertainty and out and out profiteering and gaming by mortgage lenders - with Lehmans running with a ratio of 35:1 between the book price of its financial instruments and "true" assets. It was a house of cards - built on the presumption that the American Dream was infinitely expandable. It is not. And it is not in Auckland. Policy settings need to be changed to incentivise the market and encourage the private sector to develop with the long term to the fore - not an after-thought. "...ARC couldn't organise a booze-up in a brewery, even if they did get DavidBeckham over to pour the drinks. But it's true, apparently...." - that's what Jim Hopkins wrote in NZ Herald newspaper on the 11th December. And now the public waits while the Auditor General gets to the bottom of the Beckham matter. Everybody wants to know how much public money it cost, and who to blame. Funny how this story obscures the really painful ARC story. 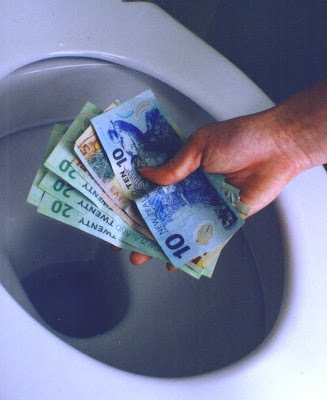 Just a couple of days later, the NZ Herald reported: "...Plunging global share prices have wiped $25 million in three months from a $1.2 billion fund for public transport and stormwater in Auckland. The books of Auckland Regional Holdings turned red in the first quarter of the 2008-2009 financial year on the back of an investment exposed to emerging market shares...."
But nowhere in that report can you find a single quote from the ARC politicians accountable for the decision to invest around $300 million of regional savings in global investment schemes. The $25 million loss is "unrealised" at the moment. $25 million are the paper losses for September 2008. The ARC hasn't been advised yet what the losses are for the months of October and November 2008. But these months saw spectacular losses internationally. Could be another $50 million down the toilet. Makes the Beckham thing look like a Sunday School picnic by comparison. It gives me no pleasure at all to have voted against this investment. I was one of a minority of councillors who opposed it. The decision was taken a couple of years ago - in the last term of ARC. The politicians in charge then are the same as now: Cllrs Bassett and Walbran sat on the ARH Board then (and do now), and Cllr Mike Lee was in the ARC Chair (as he is now). They led the voting in support of this risky investment. I well remember how the debate went. What was extraordinary was that ARH was not only recommending investing public savings in global investments - they advocating taking out a big bank loan as well, paying the interest, and investing that money in global investments also. They really believed this was a sensible thing to do, and that they could beat the bank rate. My experience of this stuff hasn't been significant, but what I know I learned as a councillor on North Shore City Council when we sold our shares in Auckland International Airport. This was sometime before the end of 2004. We got over $82 million. I remember our investment bank advisers were keen that Council should invest that money. "Maximise return", they said. But NSCC finance officers advised that the prudent action for a city council was simple. They advised we desposit the money in the bank - to minimise risk. The emphasis was on risk minimisation. Not return maximisation. That time, councillors took the advice of their officers. The money went into the bank. It has since been applied to North Shore infrastructure projects. While ARC councillors were persuaded to take a risk with regional savings, they have not - yet - agreed to take out a bank loan and chuck that into international bonds. But Cllr Walbran reckoned it was an OK thing to do. His business restores old MGs. Tweedledum reasoned this way: "it's like me taking out a loan to buy MG car parts. I get more from selling car parts than the loan costs me. It's like that..." I wasn't the only one to question his judgement. Would you buy $300 million in MG car parts? Using someone else's money? Anyway. The upshot was that a "Diversified Financial Asset" was set up by ARC's treasury subsidiary ARH - with ARC agreement to that material transaction. And now we hear there's a $25 million loss. But that's just the start of the bad news. Bruce Jesson must be turning in his grave. We need that financial asset as security against the bank loan ARC will use to buy electric train infrastructure. That loan will be around $500 million. The plan is to pay the interest on that loan from fuel tax revenues. That part of the plan is OK. The problem the ARC faces is that the value of its assets is in freefall on international markets. How will the bank assess ARC's financial security? Perhaps we'll have to put up a regional park or the Ports of Auckland as security. That is one of the biggest issues for 2009. Gold Card carrying pensioners are the new wave of tourists in town. On fine summer days you see them arrive at Britomart after rush hour, coming in happy groups by ferry, bus and train, relishing free public transport, ready to rediscover their city. These are people who have paid rates and taxes for years, good Auckland citizens living in suburbia who feel alienated from downtown because driving there is a challenge and parking is worse, now delivered safely and without financial pain into its heart. Some pick up brochures, unsure of what is there, hungry to experience all that is on offer. Ready for an enriching and interesting day. Good coffee, food and drink is close at hand, along with a diversity of retail offerings, a couple of cinemas and the Civic Theatre. But unlike other harbour cities of scale – even Wellington - there is no generous public waterfront access to seaviews, few leafy city squares, limited places to sit without having to buy something, little in the way of museums or heritage displays, and few churches. Auckland is not a godless city, although it exhibits unchristian disregard for the needs of its impoverished citizens and the cultural aspirations of its indigenous population, and it lacks the tolerant public and civic community spirit evident in many cities without Auckland’s natural beauty. Unless this attitude changes along with land development patterns typical of the last few decades, Auckland’s potential as a destination for its citizens and for visitors, and as a social wealth generator for New Zealand will be frustrated. The poverty of public spirit in Auckland planning began in 1840 when Hobson ripped off local Maori buying 3500 acres of prime waterfront land for 273 pounds to build Auckland. In six months Hobson’s agents had auctioned 44 acres to property developers raising 24,000 pounds to build roads for New Zealand’s first capital city. Only twenty five years later, the capital shifted from Auckland to Wellington to be nearer to the gold rich South Island which might otherwise have formed a separate colony. This left Auckland to its few thousand citizens, many of whom had made good their escape from the open prison of Australia, who busied themselves buying more cheap land from maori and expanding the colonial city. While Gabriel’s Gully ran out of gold over a century ago, Auckland’s goldmine - property speculation – continues to the present day. Auckland’s development track-record is written in its streets and urban fabric. Private wealth and relative public squalor is embedded in the way Auckland has been planned and funded. The value Auckland accords its history and heritage is reflected in the few buildings, structures and streetscapes remaining that are more than a few decades old. Wellington’s public realm benefited from decisions of the 1920’s Coates Government which passed Value Uplift legislation requiring that land value capital gains realised after rezoning and urbanisation would be taken by Government and invested in public infrastructure including rail and state housing stock. It was argued that to receive a capital gain from land, owners should demonstrate that the profits only existed because of their actions – not those of the Government. The 1950’s saw this law repealed because the market-led American Dream of motorways and suburban development appealed more. By then Wellington had largely built its suburban rail network and its compact city centre, but Auckland’s rail plan was still on the drawing board where it lies today, and Auckland sprawled creating joyless suburbs a motorway drive away from an impoverished city centre. That is the legacy of the American Dream in Auckland. Little wonder there is little opportunity now to meet the needs and interests of our retired citizens wanting to enjoy downtown Auckland. While the Metropolitan Urban Limit imposed a decade ago slowed the pace of sprawl, more motorways are being built and planned through the limit, puncturing the Auckland Growth Strategy which promotes containment. The Development Levy regime requires new developments to pay for the cost of public infrastructure they need, but that does not include regional public transport infrastructure. These limited measures are heavily criticised by the development industry, made lazy by easy profits from greenfield development and un-motivated by more challenging inner city redevelopment opportunities. Perhaps they can be encouraged now that both Labour and National support electrification and use of commuter rail in Auckland. But it doesn’t matter how good the railway is, or any downtown cruise ship terminal for that matter, if there is nowhere to go, and nothing to do, that is truly in the public domain on the waterfront. As Auckland’s Grey Power visitors are now discovering. A popular public waterfront development is essential. The Princes Wharf Hilton development is a fantastic example of what not to do. Those who criticise Planning Commissioner decisions regarding the Wynyard Quarter high rise proposals miss the target. Proposals to optimise revenue from waterfront developments originate in Auckland Regional Council railway infrastructure planning. The ARC is leading this particular public-private-partnership initiative which will alienate the public from that part of the waterfront, just as surely as Hobson alienated Maori from Auckland land to fund the city’s roads. 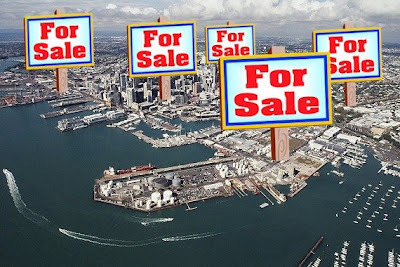 And taking Queens Wharf away from the Ports Company to build another cruise ship terminal will further destroy Auckland’s capacity to develop its waterfront as a public destination for citizens and tourists alike. Auckland’s future success now depends on a new deal with Government, a partnership to deliver a city centre public realm and waterfront we all love to visit.